Isiah Thomas is a bit sneaky. Isiah Thomas is a bit belligerent. Isiah Thomas is a bit mathematically challenged. But if I was rebuilding an NBA team, Isiah Thomas would be the first person I'd call. 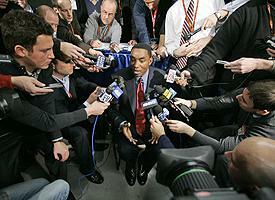 In the Big Apple, Isiah is always the center of media scrutiny. I was sitting in Madison Square Garden the night Isiah made Balkman the 20th pick in the 2006 NBA draft. I heard the boos and the scathing criticism. I also couldn't believe he didn't select UConn guard Marcus Williams -- at least for the purpose of having tradable talent. And yet here we are, seven months later, and I can't find another rookie picked outside of the top 10 that makes more of a consistent impact when he's in the game than Balkman. I'm not saying Balkman's going to be a star, but I am saying it appears Isiah has done it again. For all of Thomas' shortcomings as a general manager -- and he has his fair share of them -- his greatest strength, identifying talent, is among the best in the league. When you consider that eight teams passed on Tracy McGrady, six teams passed on eventual Rookie of the Year Damon Stoudamire, he swapped a faltering 34-year-old Kurt Thomas for a fairly talented 26-year-old Quentin Richardson, he plucked David Lee (the only second-year player averaging a double-double) with the 30th pick, and he watched Chicago overpay for 32-year-old Ben Wallace while 24-year-old Eddy Curry is developing into one of the best centers in the league, you begin to see that maybe, just maybe, Thomas isn't the fool so many pundits paint him to be. Yes, the Knicks are below .500 and have been for much of his three-year tenure. But like it or not, they are only one game out of first place heading into Wednesday's game against Philadelphia. And while it is true that the Atlantic Division is downright awful, of all the teams that did not make the playoffs last year, the Knicks have the best core of young talent. Consequently, they are a lot closer to regular playoff appearances and being NBA Finals contenders than you may think. If Lee, Curry, Richardson, Channing Frye and Jared Jeffries stay healthy and together, within three years they will be in a tug-of-war with LeBron James' and Dwight Howard's squads for supremacy in the East. Unfortunately, the architect behind this will not be there to see it happen. And that's too bad, because before Thomas arrived in December 2003, this team had no hope at all. Now, I see a young squad that is beginning to understand how to beat good teams. These Knicks should lose to Phoenix, San Antonio and Dallas, because one of those three teams is going to win the championship this year. But they are 10-10 after their 5-11 start and watching Curry dominate Ben Wallace and Rasheed Wallace in wins over the Bulls and Pistons I can see better days are not too far ahead. Gotta give Zeke credit for David Lee -- he's been outstanding. Don't get me wrong, Thomas can be prickly. And he's made his share of personnel mistakes -- Jalen Rose, Jerome James and Malik Rose, to name three -- but I can't fault him for being aggressive. He gave up Trevor Ariza, a No. 43 pick, for a shot at seeing whether three time All-Star Steve Francis could coexist with Stephon Marbury. I don't fault him for trading Keith Van Horn for Tim Thomas because, as we saw during last year's playoffs, Thomas is an incredible talent when motivated. And I especially no longer fault him for drafting Balkman, who blocks more shots than No. 2 pick LaMarcus Aldridge, grabs more rebounds than No. 4 pick Tyrus Thomas, and has managed to earn 14.3 minutes per game and cheers at The Garden while the Warriors sent Patrick O'Bryant, their No. 9 pick, to the D-League. Balkman is a guy few thought would make an NBA roster, and yet his 15 rebounds in a 97-96 win over Utah is the most a rookie has grabbed this season. Some say Isiah could have gotten Balkman in the second round, or even signed him as a free agent. I say take a look at the 2006 NBA draft and point out a player selected after Balkman who could have helped the Knicks more this season. Thomas gets blamed for the CBA's filing for bankruptcy, but few mention that the league was headed in that direction before Thomas even got involved. Critics say the Pacers floundered with Thomas as coach, but few care to mention the roster he inherited was not the roster Larry Bird led to the Finals the season before. Or that he was dealing with Ron Artest before the general public knew what a distraction Ron Ron could be. And now Thomas is being blamed for the futility of the Knicks, as if a championship banner was unfurled the day before he arrived. This franchise has not won it all since 1973. It hasn't done anything of significance since making the Finals in the shortened season of 1999-2000. But that doesn't matter, everyone is out for Thomas' blood and he is certain to be run out of New York. Then a new guy is going to come in, find a point guard who works, and ride Thomas' eye for talent to a 50-win season. Some say Isiah faces extra scrutiny because he's black. I'm not sure if that's true. After all, Zeke has made a lot of enemies and burned a lot of bridges over the years -- and that was before that strange sexual harrassment lawsuit. But if snake oilers such as Don Nelson, Larry Brown and Pat Riley can still find work, so should Thomas. Because the truth is if you look at his entire post-playing resume -- and not just the bad -- you will find an incredibly sharp basketball mind. One who has this uncanny ability to spot talent where other "geniuses" see none. I would hire him. I just wouldn't leave him alone with the checkbook.